Want to train like a football player? NFL veteran Steve Weatherford shows you why punters make great role models. Weatherford calls the uncomfortable-looking position below the "Van Damme," in honor of the actor's iconic demonstration of it in the 1988 martial arts classic Bloodsport. Ironically, however, he hadn't actually tried to do it until recently, when prompted by friends at a party. "Flexibility and explosiveness are the two most important things for a punter," he says, "and I've always stretched like crazy, so when I tried to see if I could do it, it wasn't that hard." Punters aren't supposed to look like the New York Giants' Steve Weatherford. They're supposed to be scrawny ex-soccer players who stand in one place during games, huddled behind the bench in their oversize parkas, waiting for those few-and-far-between times when they're called onto the field to do something requiring neither hitting nor running. Underneath their pads, punters aren't supposed to be 6-foot-2, 211 pounds at 5% body fat. 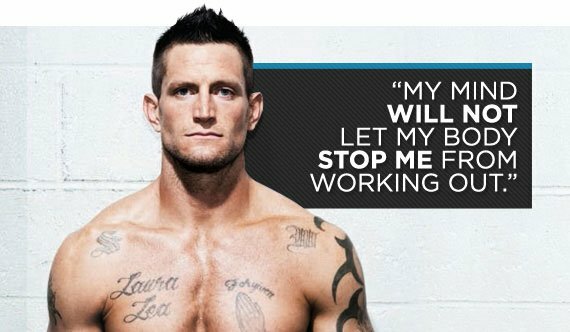 Weatherford is, however, and says you can be, too, provided you're willing to put in the time. "It's a combination of being blessed with good genetics and being disciplined," Weatherford says. "A lot of guys might wake up one morning with a sore back and take the day off, I never do." Currently in his sixth NFL season, Weatherford, who is among the league's most accurate punters, unseated incumbent Matt Dodge in training camp, when most observers had expected Dodge to hang on to his Giants starting spot. To the University of Illinois graduate and Crown Point, Indiana, native, his football success is attributable to a training and nutrition game plan forged during his rookie season with the New Orleans Saints in 2006. Weatherford claims punting a football is similar to driving a golf ball-a scenario where everything needs to work in concert, the same way, every time out. If one little thing is off - a hamstring is pulled or the hips are tight - a punter's rhythm can be completely thrown off. The idea is to be as explosive as possible when it's time to punt, six to eight plays per game, on average, and to ensure physical consistency. "You can't do this perfectly every week," he says, "but you want to feel exactly the same way every single Sunday. You want to build that explosiveness in the off -season, then train to maintain it so everything is the same during games." Since his entire year comes down to those six to eight bursts of perfectly coordinated explosiveness - as opposed to position players, who need significantly more stamina - Weatherford's off-season training resembles an Olympic high jumper's regimen more than it does a linebacker's or a running back's. The key, he says, is the yearly regimentation he learned from his mentor, veteran placekicker John Carney - who spent 23 seasons in the NFL. "It's a long season," he says. "You've got four pre-season games and 16 regular-season games, and if you get into the post-season, you could be playing 24 football games in five months. You get tired, the season grinds on you, and your knees, back, and hips start to hurt. You have to taper off at some point and maintain the work you did in the off-season to keep consistent." For this veteran punter, looking more like a DB or safety comes down to how much discipline you're willing to exercise. "If my knees are sore, and I don't feel like I can run," he says, "I'll find something I can do, like sprints on the bike or swimming. The difference between looking this way and not is that I have that discipline, and I won't ever let myself cheat myself." Weatherford trains five days per week, taking Wednesdays and Sundays as either active rest or off days. He'll start each workout day with dynamic flexibility. This involves a series of jumps, skips, and high kicks designed to raise his core temperature and head off injury. After that, it's 15 minutes of static stretching, which he does after weight training, followed by a different type of cardio each day. "I spend the off-season in San Diego," he says. "There are great geographical formations in the hill country for me to just go out and run." If you're playing in the NFL, Steve Weatherford says, you must be doing something right, but fans watching at home typically don't envision their team's punter or kicker as some ripped-to-shreds specimen who regularly goes beast mode in the gym. Along with Weatherford, however, there are a handful of other kicking specialists who've raised the bar for these positions. Take Dallas Cowboys kickoff expert David Buehler, for instance. At the 2009 NFL scouting combine, Buehler's performance compared favorably to that of several linebackers and running backs. To wit, he performed 25 reps on the bench press with 225 pounds, ran the 40 in 4.56 seconds, and is often used as a regular positional player on the Cowboys' kickoff - and punt-return teams. 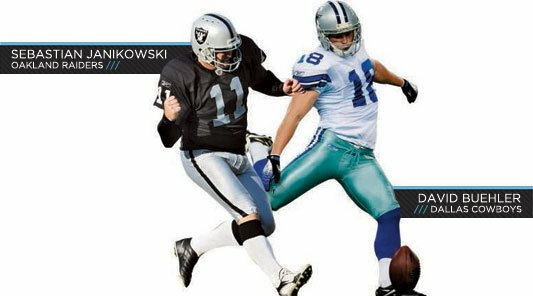 Oakland Raiders veteran kicker Sebastian Janikowski, who last season tied the NFL's all-time record with a 63-yard field goal, is another mold-breaker. At 6'2", 250 pounds, Janikowski's workout numbers at Florida State-bench-pressing 395 and recording a 4.6 in the 40-rivaled those of just about any Seminoles lineman. "The way the game is now," Weatherford says, "guys are bigger and more athletic, and the kicking positions are no different. You need that explosion level and good body composition to compete."